Let’s be frank. There is a difference between “lifestyle wealth” and “real wealth”. You may own luxury cars and live in an enviable postal code. You dine in the best restaurants and have your tailor on speed dial. Today we all want to look wealthy to show we’ve “arrived”. Hey, we like nice cars, a sailboat and three holidays a year too! It’s hard to escape these primal needs in today’s “keep up with the Jones” media circus. And YET there is a carrot hanging out there. If you own a business, you could be sitting on a winning lottery ticket that would put you into the high-net worth category… if you were able to sell your business. Did you know that most companies are un-saleable according to the National Post and our own research with deal makers? 90% of owners fail to sell their companies. How come? They didn’t make the business saleable 2-4 years before wanting to exit. These statistics certainly jolted me and my husband awake. Not only do we want to make our own company saleable, we want our clients to have that certain financial future too. We work with business owners that have invested thousands into their companies. We want to make sure they are in a position to be rewarded for all that they’ve done so that their companies continue to be a great place to work for employees and contribute to the economy. It’s why we host webinars, write books that show how to make a business saleable and speak to advisors and associations about it. An owner at a recent event asked us why we do this. This is what I told him: “If you had a solution to a problem that you saw was going to hurt a lot of people and you knew that they didn’t realize this problem was coming, wouldn’t you want to alert them?” I know this problem keeps us moving forward. 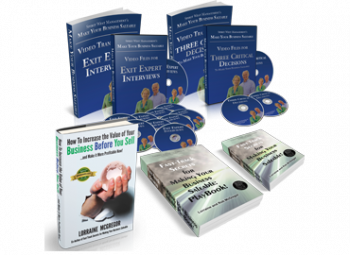 WHAT DO SUCCESSFUL AND WEALTHY ENTREPRENEURS DO THAT YOU MIGHT NOT BE DOING INSIDE YOUR BUSINESS? Well we all know we should be saving more as Suze Orman and David Bach and our financial advisors tell us that’s important, so definitely get that aspect of your financial routine in order. What I’m talking about is learning to see your business as an asset that you can get a return on. Successful people like you and me, whether they are athletes like Darian Durant, Grey Cup 2013 winning quarterback, entrepreneurs like Steve Jobs or leaders llike Nelson Mandela envision the future they really want. And then do the right things to make it happen. Envisioning is an essential skill of a great leader. These leaders make choices today and take appropriate action now so they are in a position to get the future they really want. Own a business? Position it for the future you want now. Do you want to be “lifestyle wealthy” or “truly wealthy”? 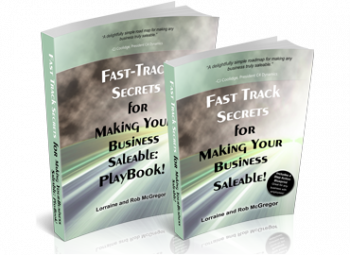 CHOOSE WHICH PATH TO TAKE 2-4 YEARS BEFORE THE BEST TIME TO SELL YOUR BUSINES. You will become a high-net worth entrepreneur when you recognize your regular pay check and dividends may not keep you in the lifestyle you have become accustomed to when it comes time to move on from your business. Lifestyle Option #1 Keep your business and continue to work in for at least the next ten years and continue to take the same salary and dividends that you do today. Close the business when it makes sense. Lifestyle Option #2 Keep your business and continue to work in for at least the next ten years and save and invest more of your salary and dividends from the amount you pay yourself today. Close when it makes sense. Lifestyle Option #3 Make your business saleable so that your business is attractive to buyers when they are looking and increase the likelihood you will attract a premium offer which earns you a return on your investment. So which option is going to work best for you? Join us for our webinar and we’ll reveal the financial future each option offers. The size of return you want on your investment in your business. The legacy you want to leave inside your business. The legacy you want to leave for family. The lifestyle you want to lead after you don’t run your business any longer. Your interest in making changes inside your operation. The amount of preparation needed to make it saleable. What you think the business is worth vs what a buyer would pay you for it. Whether there is an ideal buyer for your type of business with the way you manage it today. Envision a big return on your investment. Imagine being able to make the changes inside your business that would give you financial freedom and peace of mind. You’ve made it more profitable and easier to run as a result. 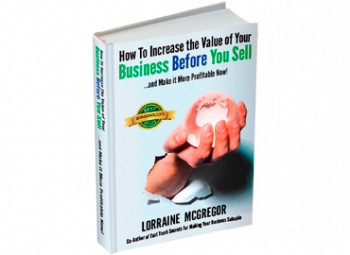 Your efforts have potential buyers circling because they know how to spot a saleable business at 40 paces. You’ve increased the probability of being able to sell from 10% to be almost certain. After you sell you will easily continue to pay yourself the same amount you do today well into your 90s with lots left to share with family. The risk you chose to move out of your comfort zone to change how you run your business pays off. What do you want in return for continuing to work in your business? These are powerful questions that can open many possibilities for a vibrant future, if you learn how to answer with the right insider knowledge. Register for our next webinar, Tuesday December 17, 2013 at 11 AM PST/ 1 PM EST / 9 PM GMT here. P.S. Bring your last two year’s income statement to the webinar. It’s time you learned what your company is valued at today.